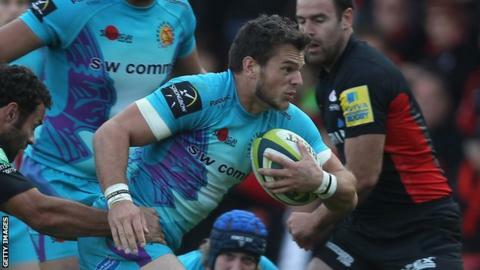 Jersey have signed Exeter Chiefs winger Mark Foster on loan until the end of the season. The 29-year-old is the second wide man to join this week after Connacht's who are bidding for Championship survival. He has started just three LV= Cup games this season and been a replacement in one Premiership game. But he scored 12 tries for Exeter as they won promotion to the top flight in 2009-10. "Mark Foster has won this league before with Exeter and has a great deal of experience in the Premiership and the top end of the Championship which will be invaluable at this stage of our campaign," said Jersey director of rugby Ben Harvey. Foster, who last started a Premiership match in January 2011, began his career at Gloucester before spells at Newbury, Birmingham and Solihull and Moseley. He was the first ever Exeter player to score a try in the top flight when he touched down after four minutes against Gloucester on the opening day of the 2010-11 season. "We have guys within the current squad who haven't played a huge amount for us this season, but at the same time are still wanting to play rugby," said Exeter head coach Rob Baxter. "With the A League and the LV= Cup campaigns having come to a finish, there are opportunities for guys to go out on loan somewhere and play some rugby. "Jersey got in touch with us saying they were keen to get some players in; Fozzie said he was keen to play some rugby too, so in a lot of ways it was a good move for all concerned. "I am a big believer that rugby players want to play rugby as much as they can, so Fozzie's gone with our blessing until the end of the season, but should we need him we will be able to get him back and hopefully with some good game minutes under his belt."